Every doll has a soul. 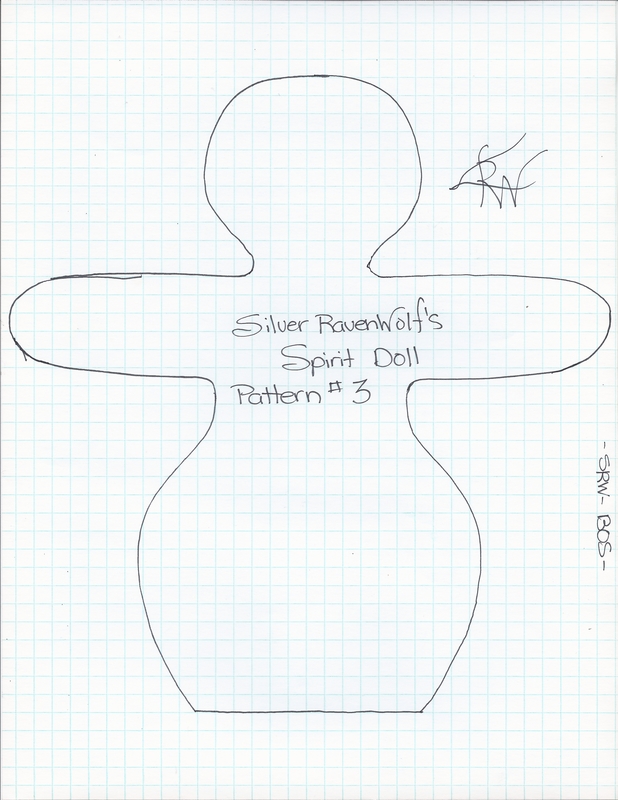 I don’t know why I started designing these Spirit Dolls. Maybe it was watching Lord Thorn quietly sew together a ritual robe for his friend by hand the other week. “Why aren’t you using a sewing machine?” I asked. I thought about that. 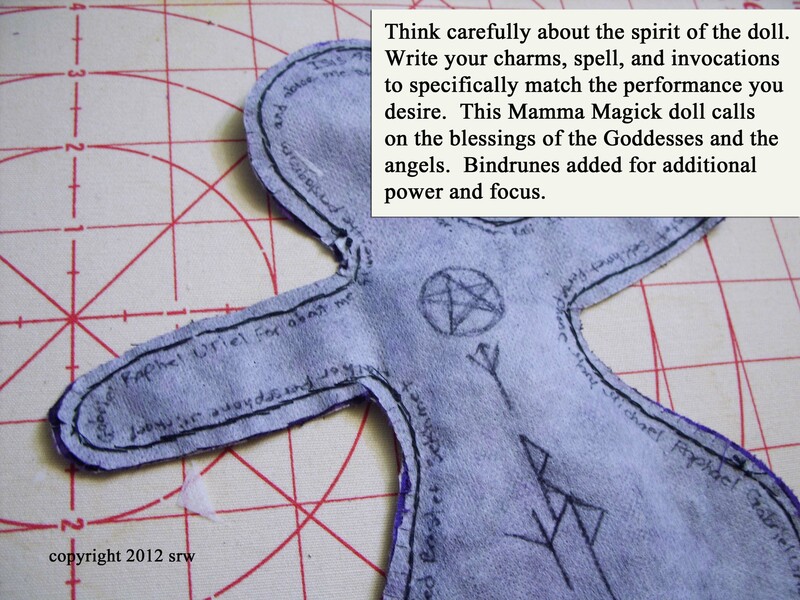 There is a special kind of contemplative joy in working magick while stitching something by hand. Too, the end product always seems to have more power. Or, maybe it was because I wrote the article on conjuring bags and my mind simply stepped to the next level. Or, perhaps a book I was looking at on found object art at the local crafting store sent the creative part of me whirling…whatever the reason, I sat one night at the dining room table not long after my conversation with Lord Thorn and began to doodle on a piece of graph paper. The doodle grew. Changed shape. I pulled out another piece of paper and began to build. 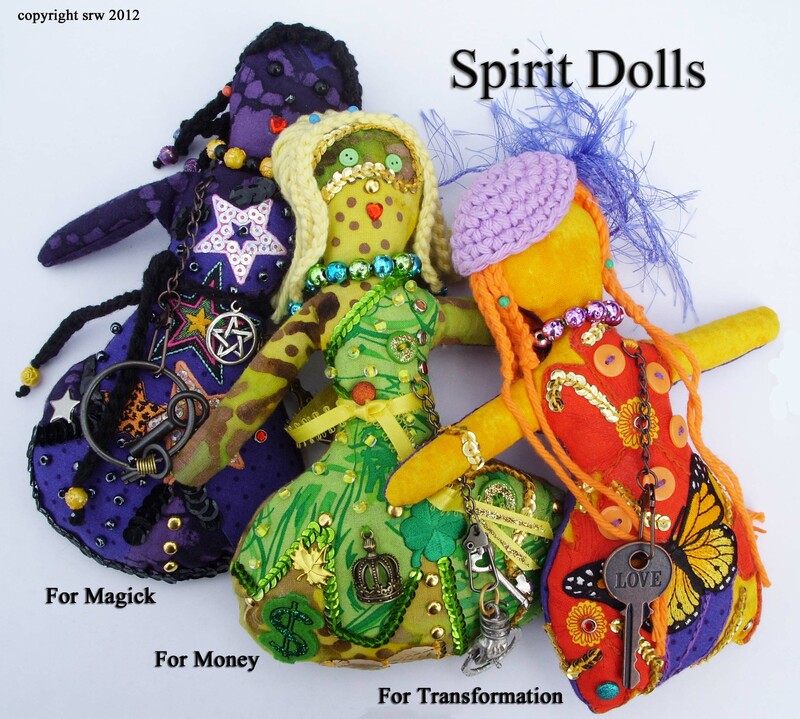 I thought about magick and about how spirit dolls have helped people for thousands of years in many cultures. I realized such dolls take shape from the depths of their maker’s creativity, fashioned from natural objects to plastic pieces, taking on their own persona. 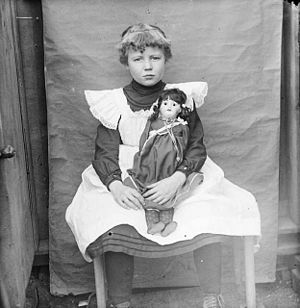 Over the centuries, dolls have brought comfort and joy, magick and laughter…and, yes, in some cases dolls straddled the line from delightful to creepy to downright scary. I thought about how the souls of the dolls begin with a spark of thought, and expand into the material world. That spark can contain healing and love, or hate and fear. Each doll has a purpose that becomes a reflection of our society in the moment of its birth. 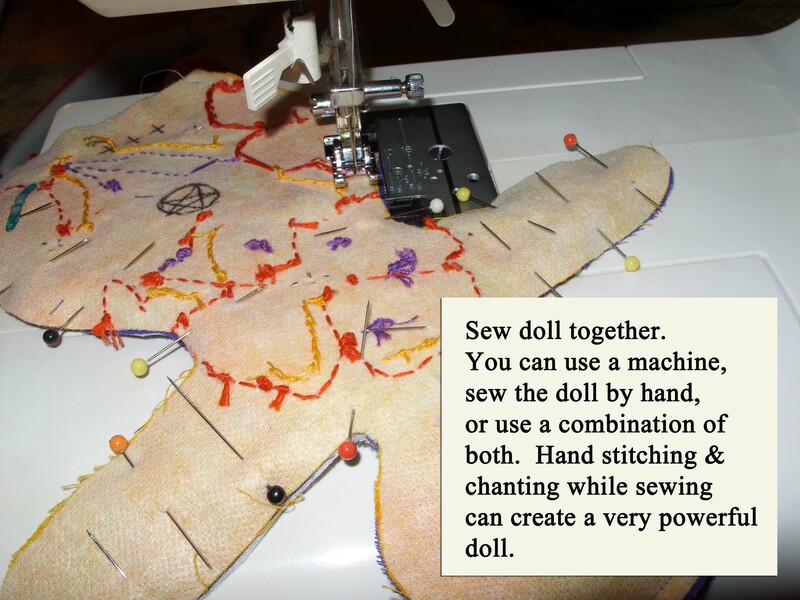 Every doll has a story, particularly the handmade ones. 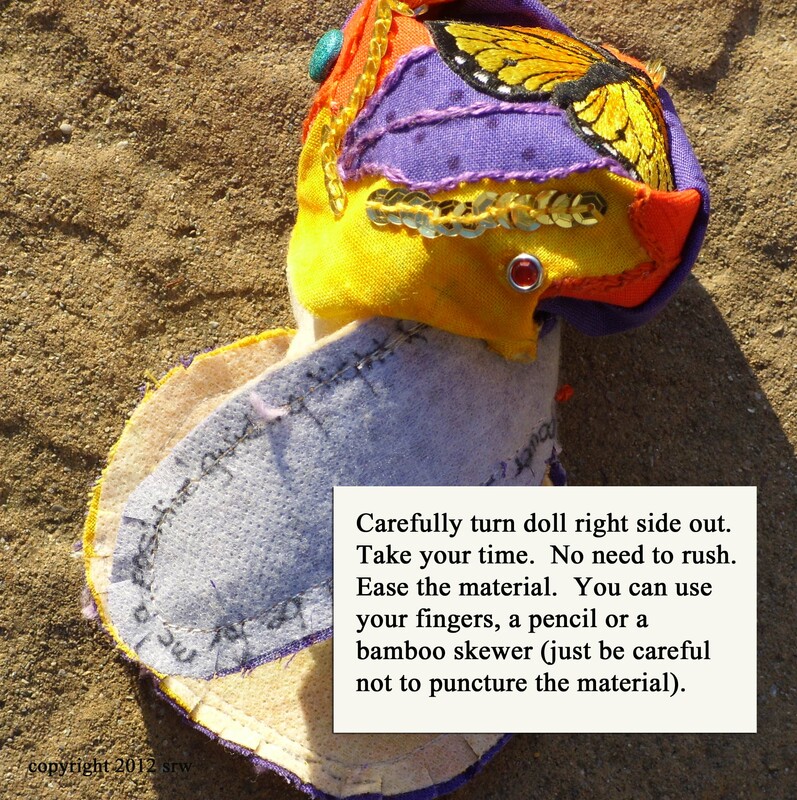 Over time dolls from the past tell the current generation of happiness and good times, of challenge or heartbreak. 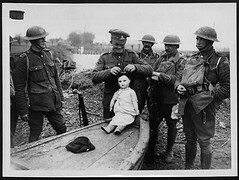 Have you ever held an antique doll and truly adored it? Or, was there one you refused to touch because it seemed…so…gosh! Yuck! I am not a “doll” person. Yeah, I like them okay. I had dolls when I was a kid. Played with Chatty Cathy, Barbie (born the same year as I — not funny), and Susie-Smart. My heart, however, went to Lamb Chop — the puppet, though I never got one. But, I digress. 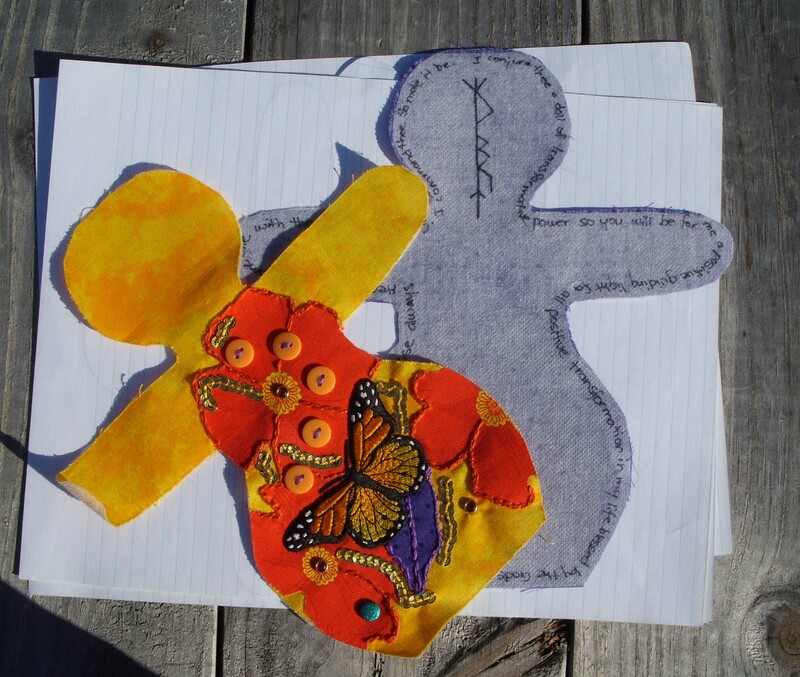 As I designed the first doll, her name came immediately to me — Mama Magick. What sort of doll would I want sitting on my altar? What energy would I like to feel? I decided to use the hour glass shape for two reasons — the idea of birth (and the infinity sign) and that the belly of the Mother contains the birth of our universe. The belly of this doll would hold herbs, charms, and trinkets to her purpose. 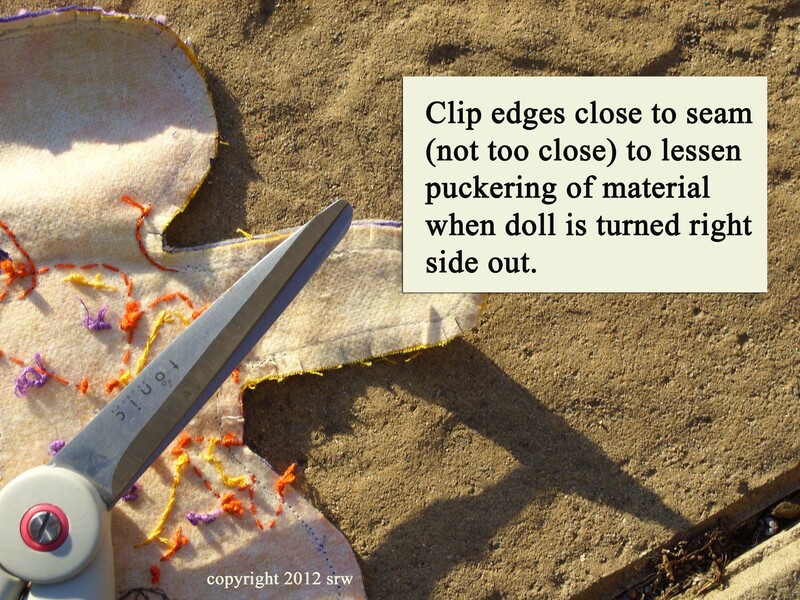 I held my hands over my notes, closed my eyes, and visualized the essence of this doll. 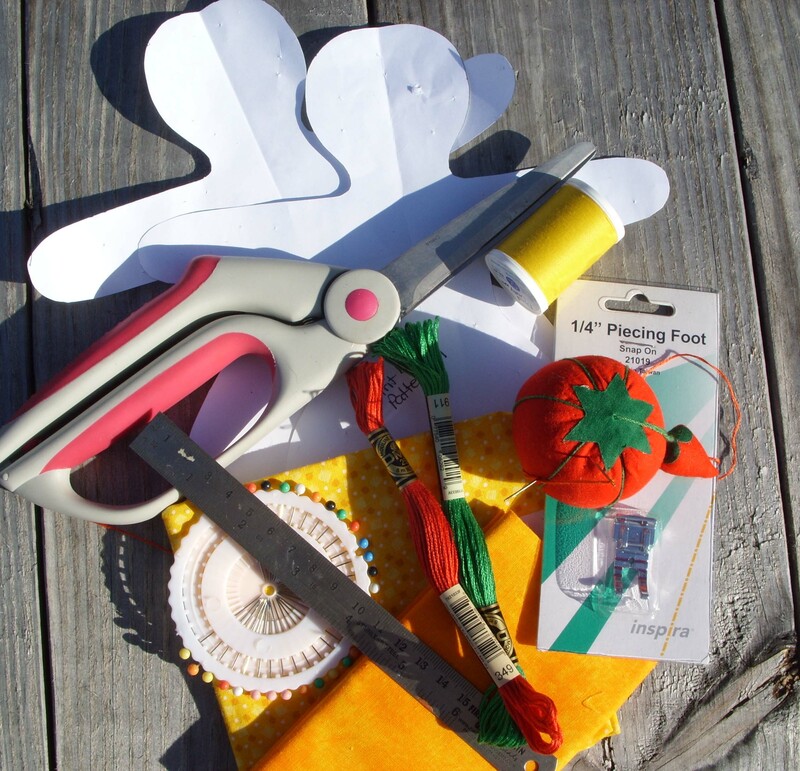 Once I finished the creative design process, I dug through my stash of crafty stuff to find embellishments for the doll. I realized that there wasn’t any limit to what I could put on the doll nor was there any “right” or “wrong”. She would be as she was meant to be, I just had to build her. First, let’s take a look at my initial drawing and thought process. 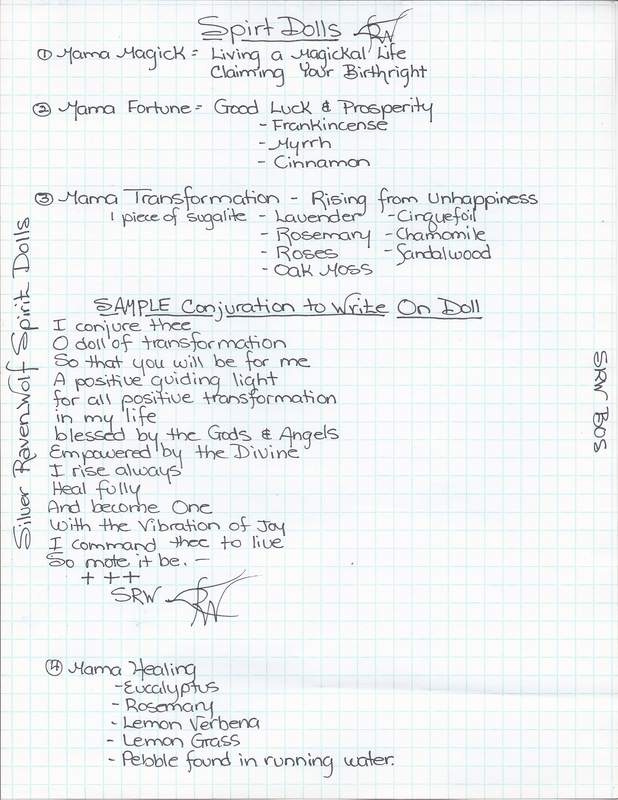 These are the original pages, now housed in my Book of Shadows. The pictorial journal below closely follows my original notes. 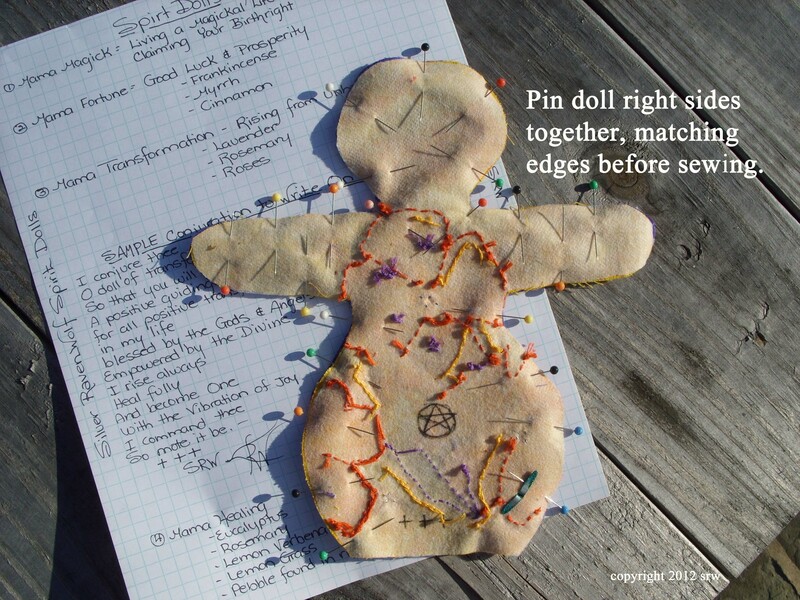 My first step included cleansing and blessing all supplies, then I moved onto the actual construction of the doll. With each stage of constructing the doll, I held my hands over the pieces, mentally combining the energy of earth and spirit. During the ironing process I sprayed the material with my activation fluid (see earlier blog article). 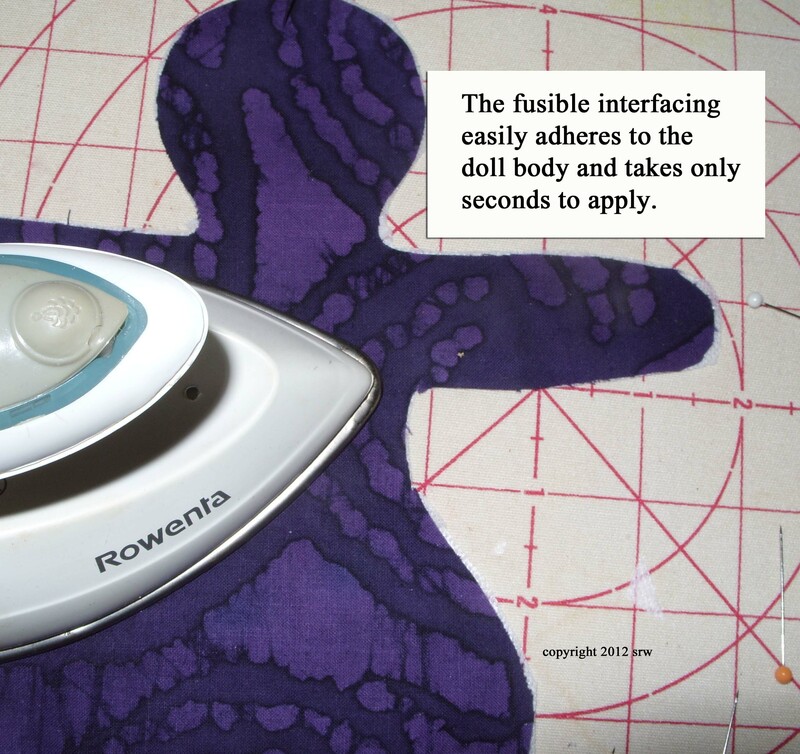 I also ironed herbs into the fabric on the reverse side of the doll, then brushed them off. Pieces for dress can be large or small. Numerous or a single piece like this. 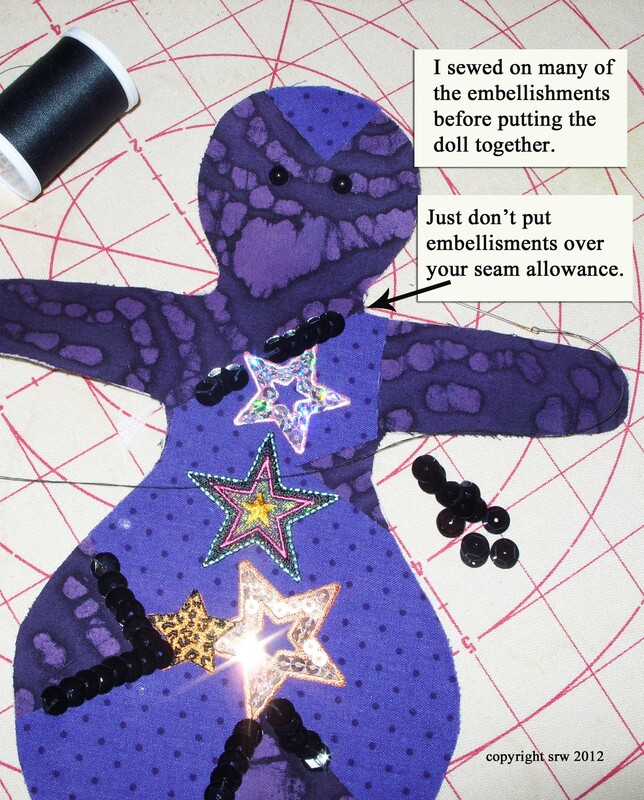 I like to add embellishments on things before I put them together; however, you can always add your embellishments after sewing the doll together. 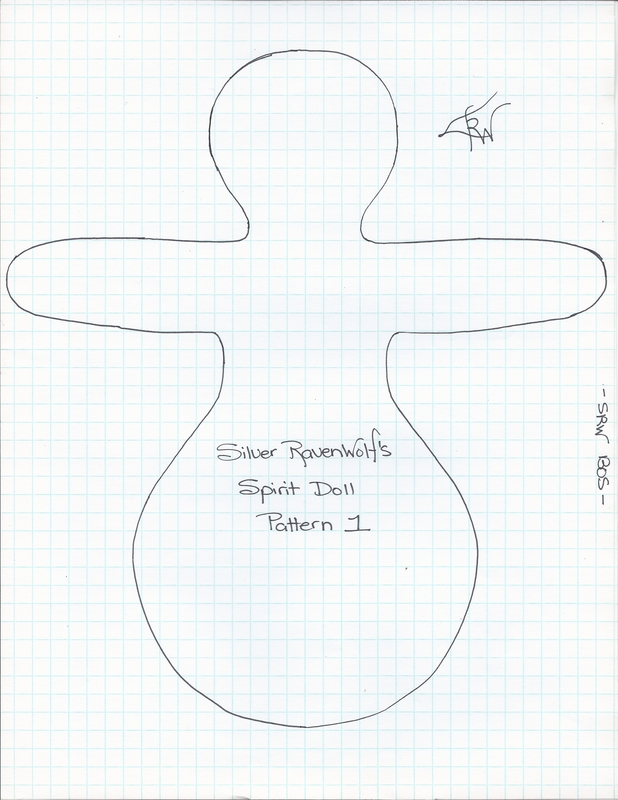 To me, one of the most important steps in creating the Spirit Doll was to incorporate charms, chants, and sigils directly on the doll. I drew these with black, indelible marker. 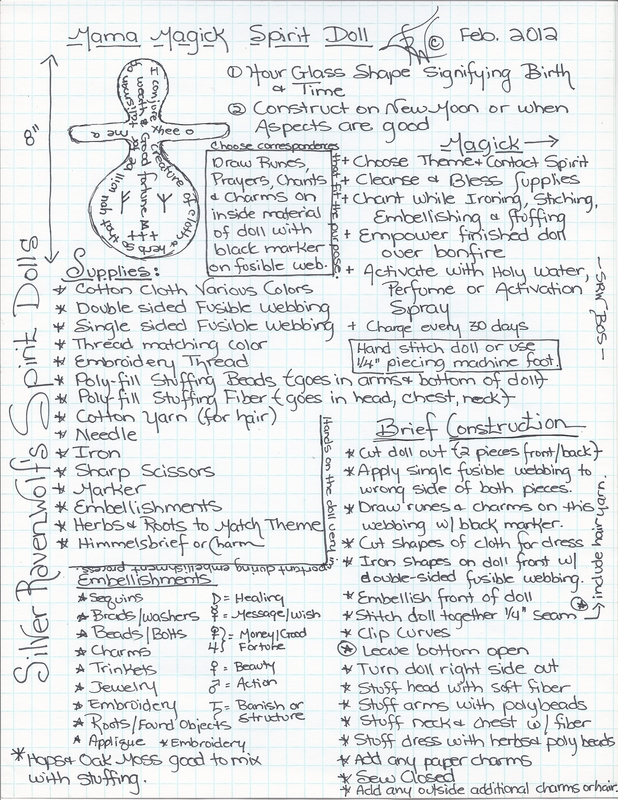 Sigils and incantation on the Mama Spirit Doll. Herbs used for the Transformation Doll. 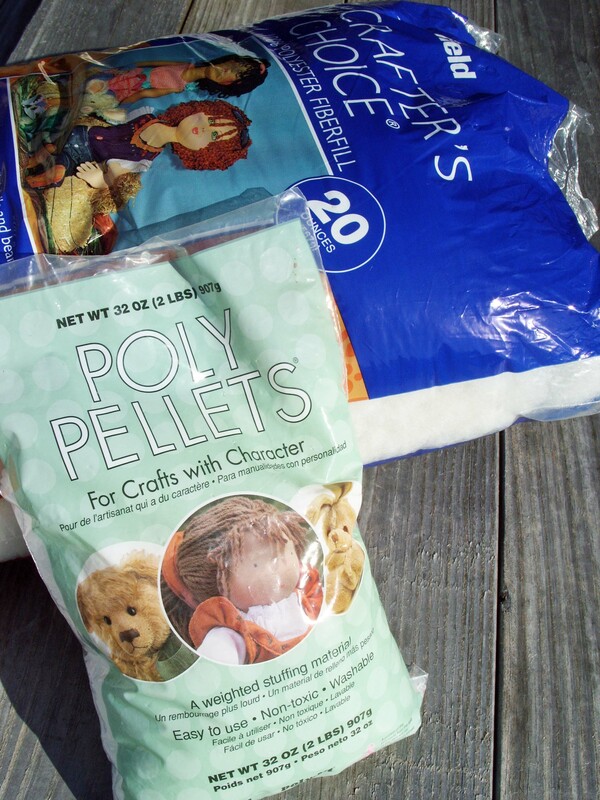 These are the two brands of stuffing I used for the dolls. I used two types of stuffing to give the body of the doll more personality. To keep the beads in the arms while I stuffed the chest, I used yarn bits to tie off the arms from the body. Once the chest area was stuffed with the soft stuffing I took off the yarn bands. 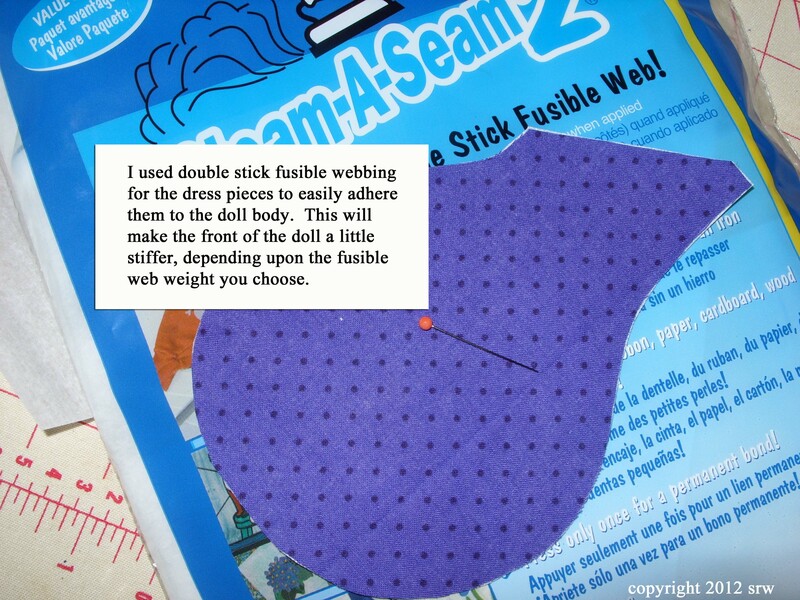 I’d never constructed a fabric doll before, so this was a new experience for me. Being a perfectionist, it was very hard for me to just let go and let the doll “become”; but, I overrode my itch for perfect and let the bohemian take over. During the entire process I blended magick with physical labor, savoring the crafty procedures right along with the magickal applications. At each step I concentrated on the soul of the doll — Her ultimate purpose — that spark that I wanted to share with others. 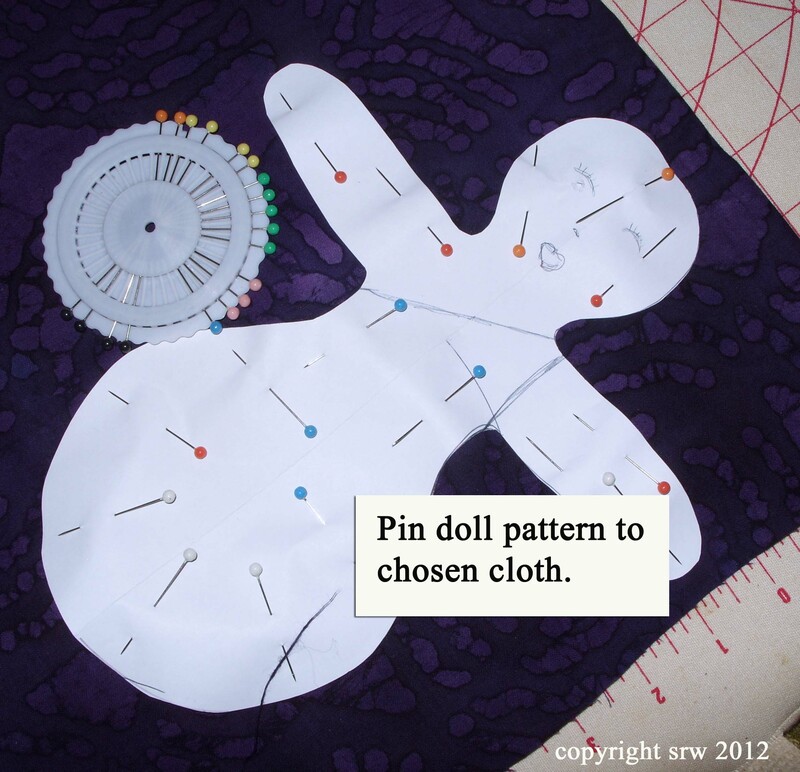 Due to the added weight of the beaded stuffing, the dolls can be positioned easier. Here’s Mama Magick hanging out in the Magnolia tree. When I finished Mama Magick, I went on to complete two more dolls — Mama Fortune and Mama Transformation, changing the pattern of each just a little bit. For example, Mama Fortune has a wider dress body. Mama Transformation has a flat edge to the bottom of her dress and a rounder head. Along the way, I experimented with the face. Mama Magick has traditional doll eyes that I found in the bottom of my sewing basket. Mama Fortune has button brads for her eyes. Mama Transformation has no face, as the face of transformation belongs to her eventual owner. The hair was my final challenge on each doll. For the first and third dolls, I used crochet chains. The second doll (Mama Fortune) I sewed most of the yarn strings into the seam of the doll, then topped this with a finished crochet chain after the doll was stuffed. 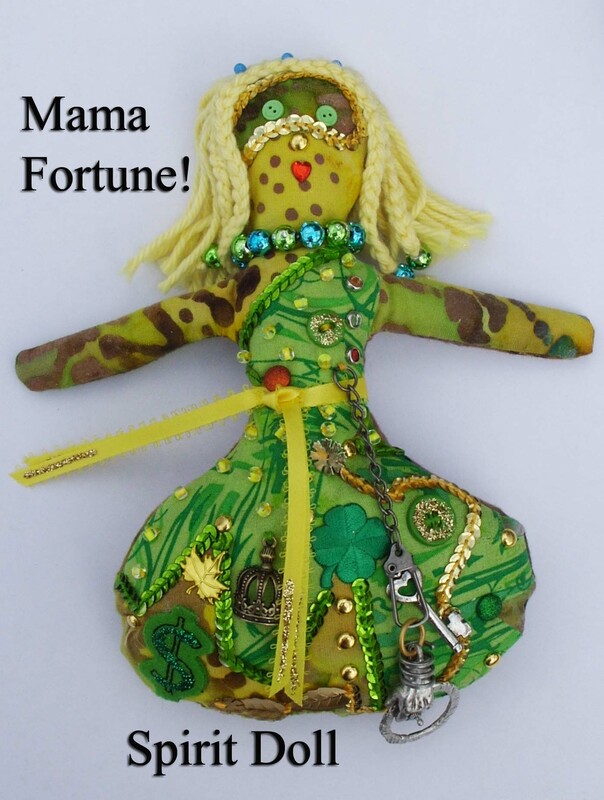 Mama Fortune is highly embellished with numerous good fortune items. 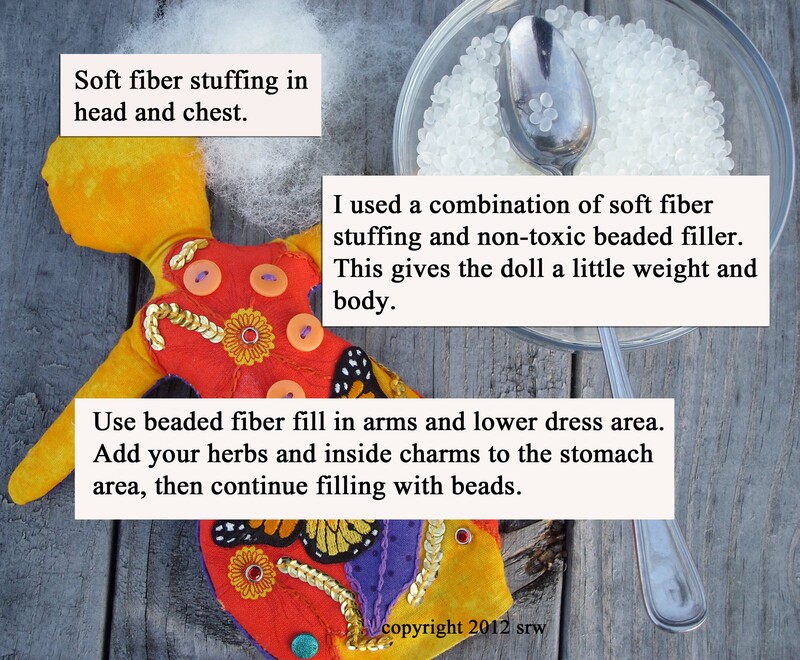 The herbs inside the doll include Frankincense, Myrrh, and Cinnamon. I also changed sewing techniques a bit. 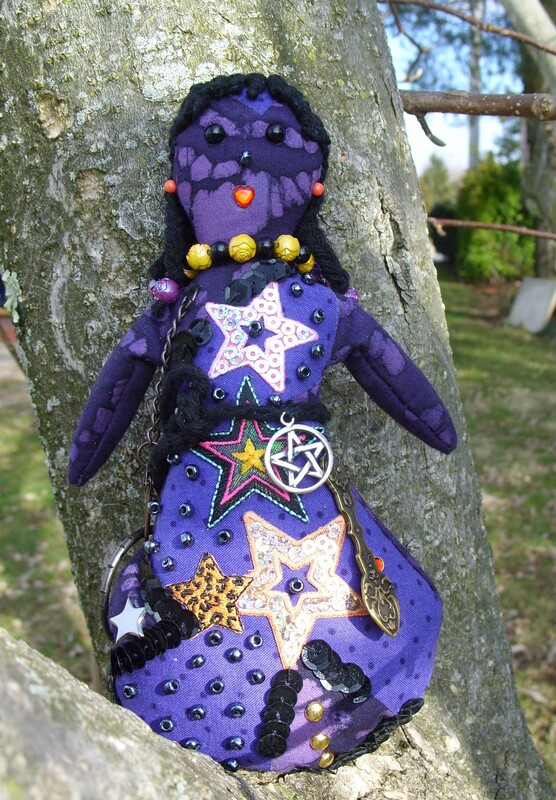 With Mama Magick, I hand stitched the entire doll. Mama Fortune, on the other hand, was put together with a sewing machine and hand stitching. Mama Transformation has a lot of hand embroidery. I found I actually preferred the hand stitching even though it took longer. For all three dolls I did most of the embellishing on the front of the doll before actually putting the doll together, making sure that I didn’t place any embellishment into or over the seam allowance (I used 1/4 inch). Mama Transformation has no face, as her “face” belongs to her owner. 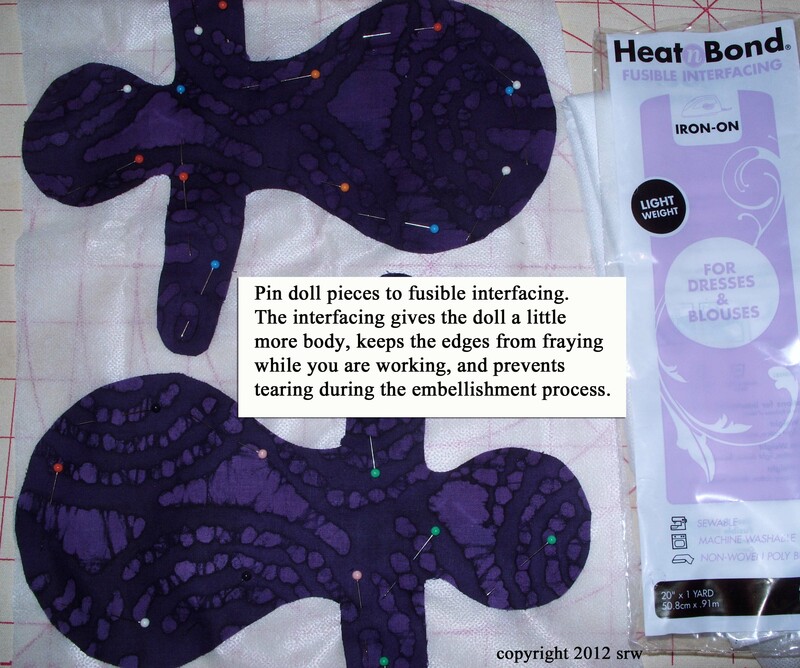 This is the third pattern with the flat bottom to the dress. Her dress has a lot of embroidery work and a special key — that of love — because we must love ourselves to transform. 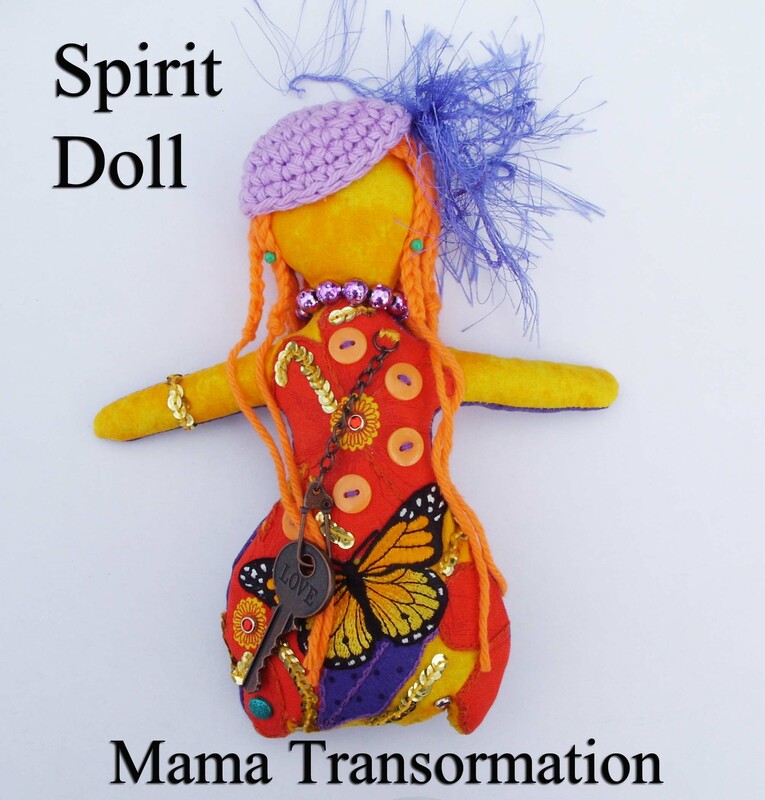 Note: If you have more ideas for Spirit Dolls, or would like to share pictures on my author page, please feel free to do so. Below you will find pictures of all three patterns used. You can store your finished Braucherei Activation Elixir in any spray bottle or glass jar. Be sure to properly mark the container. 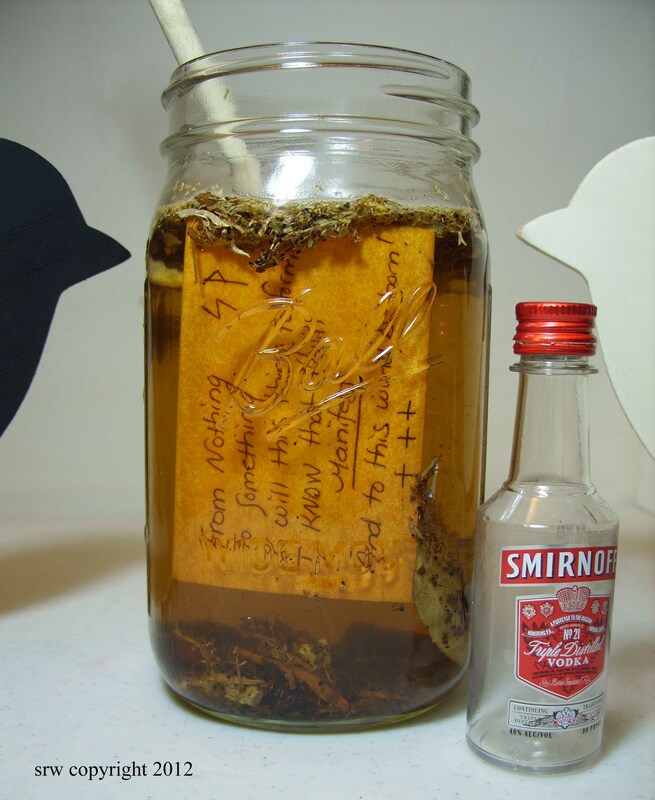 A Braucherei Activation Elixir is an herbal, water, and alcohol formula created by the magickal practitioner. The elixir can be sprayed on objects, tools, and craft items in an effort to enhance the overall power of the working. Think of the elixir as an energy drink for things, an herbal zap to awaken the item. The Activation Elixir should not to be ingested and is for spraying or sprinkling only on inanimate objects. The elixir can be a part of the blessing and consecration process, or it used further on in the working. When the elixir is used is entirely up to the practitioner. 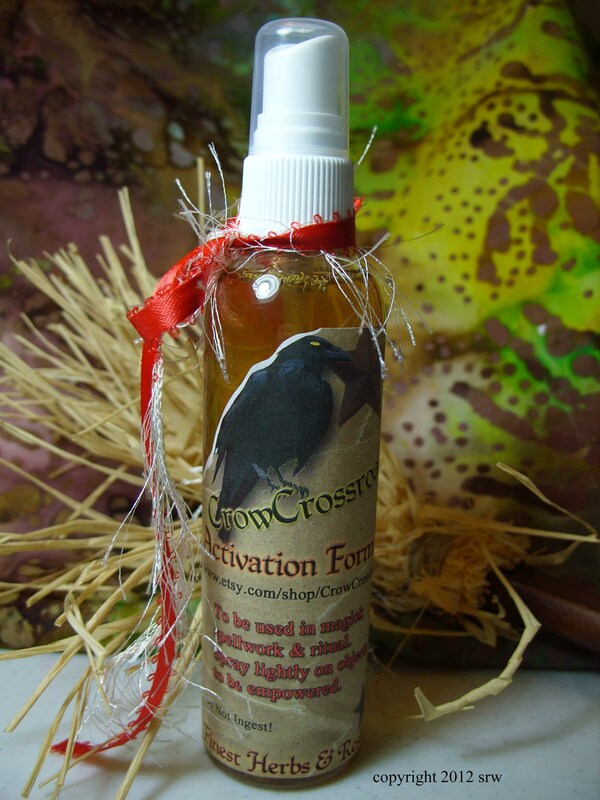 You can spray the Activation Elixir on poppets, candles, petitions, ritual tools, sachets, arts and craft projects…its use is almost unlimited! Making the Activation Elixir is very easy and takes only a few minutes to prepare. However, the activation of the Elixir itself takes approximately 48 hours as the formula should set for 24 hours before the simple ritual process begins, allowing the herbs and resins to thoroughly infuse the water/alcohol mixture. Then, the Elixir is held to the dawn and blessed, to the midday sun and blessed, to the coming of twilight and blessed, to the sound of the clock striking at midnight to be blessed, and if you are very sincere… held to the heart of the home at halfnight (3:00 A.M.) These are the Braucherei times of magick. The good part of this formula is that you don’t have to bless it all in one day/night if your schedule is just too busy. You can bless it at dawn today, noon tomorrow, twilight the next day, etc., as long as you keep the blessings in order and finish them all before you use the formula. Here are the supplies you will need to make the Activation Elixir. This elixir is entirely of my own creation. You will not find the formula printed anywhere but here. I have used the formula for several magickal operations, including find a job for a good friend, empowering poppets and fetish dolls, obtaining an important contract, and even winning a small amount in the lottery. Although the best time to begin this mixture is at dawn on a New Moon, life doesn’t always allow us to brew up potions at specific times, and as you will be empowering the elixir at dawn you can skate on the preparation time if you must. Step One. Gather all your supplies. Bless your supplies in the name of your deity. Charge all objects in your own words (with clear intent) with what you wish to accomplish – in this case to blend together to become a positive force of activation. Instruct the objects to work together for the purpose you have given. I often run the palm of my right hand over all the objects in a circular fashion, imagining the energy of the objects blending in a colorful mass that changes to pure, white light. You can write wishes or commands on the bay leaf with black pen. Step Two. 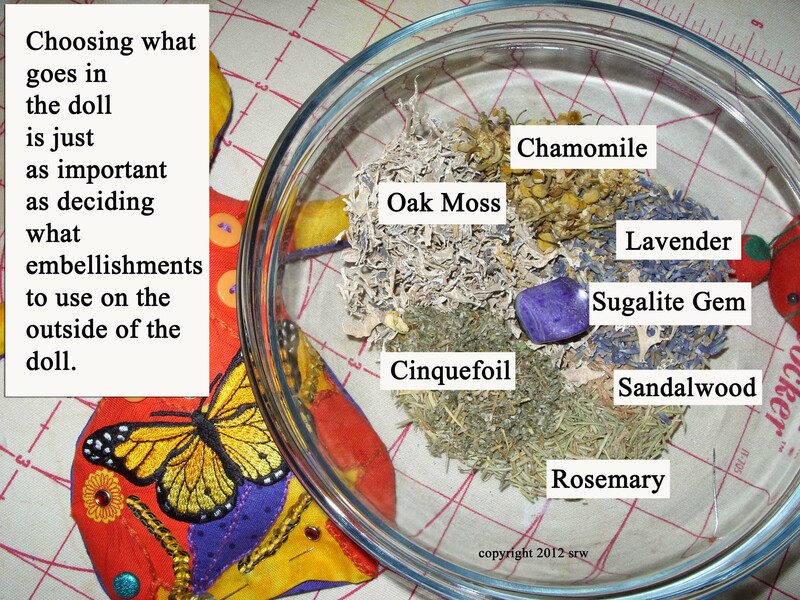 Mix the dry ingredients of your herbal formula in a clear bowl. 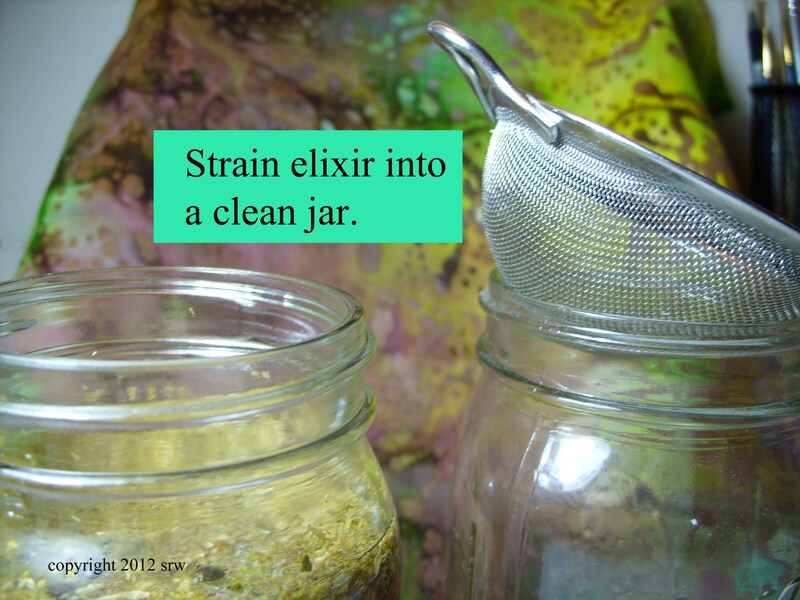 Pour this mixture into one of the clean, empty canning jars. Step Three. Add the six ounces of hot water to the jar. Let cool to room temperature. Add the vodka. Step Four. Write the following incantation on the piece of brown paper. This is my charm that I use for many different magicks. I KNOW that it will manifest and to this world be born. Draw any activation runes or designs you like on the paper. 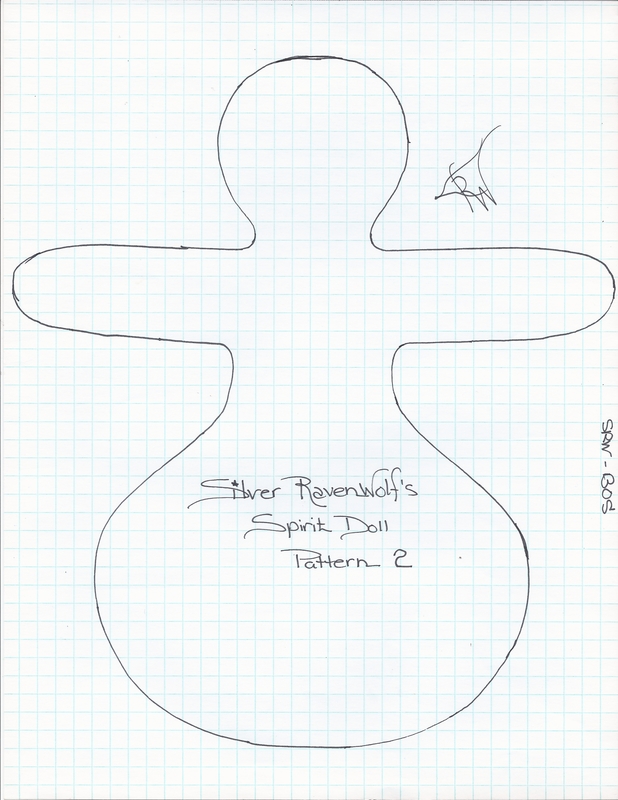 Finish by drawing three equal-armed crosses on the paper. I always recite the charm many times while constructing it. Blow three times on the paper. Place the paper in the jar. Many Braucherei practitioners have used this technique to empower liquids for a variety of purposes. Step Five. 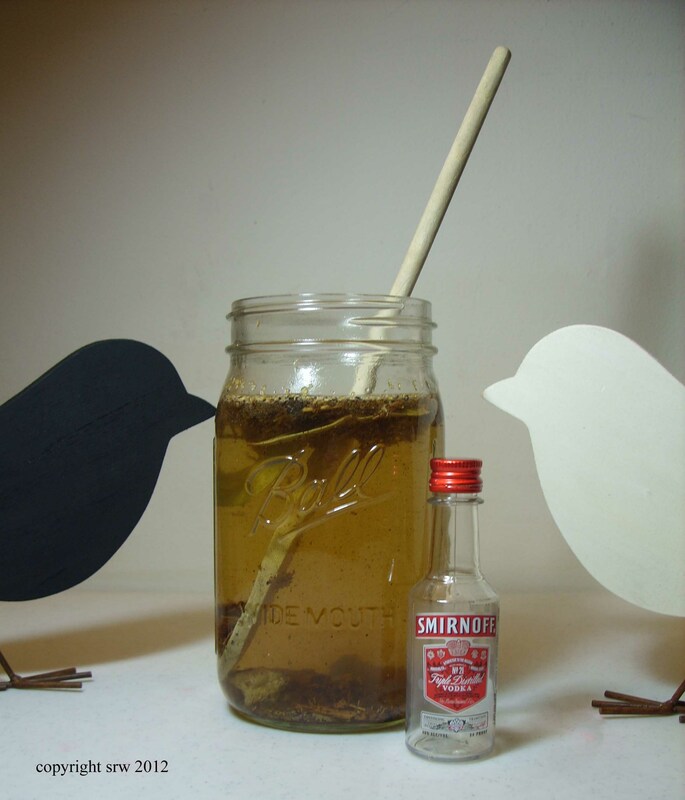 Stir the elixir with the wooden spoon as many times as you feel necessary to begin the blending process. Repeat the chant given above, keeping in mind that you are manifesting an activation liquid. Step Six. Set brew aside for at least twenty-four hours. Strain out the herbal formula. Give the used herbs to the earth. You can save the dragons blood, the High John Root and the cinnamon sticks to place in your spray bottle if you like, or keep them in the jar, or allow them to dry and use elsewhere. The formula will have a slightly sweet aroma. Step Seven. Begin the blessing process. In your own words, ask for the blessings of Spirit to be placed upon this Elixir at dawn, noon, twilight, midnight, and halfnight. Step Eight. 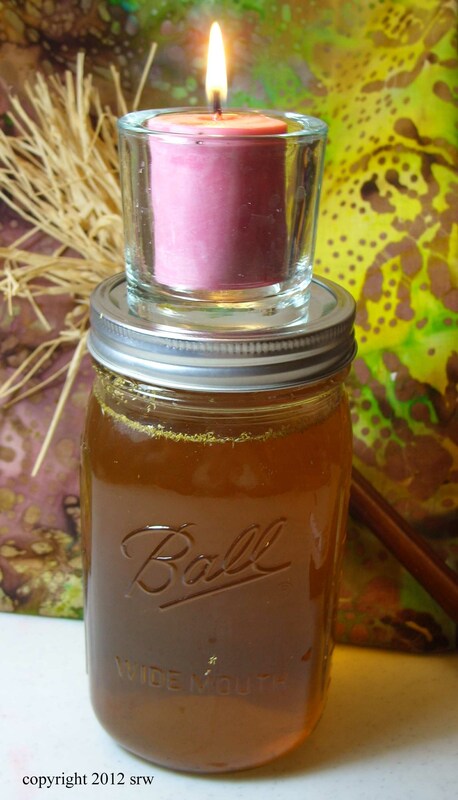 Once the blessing process is completed, cap the jar and set a red candle on the lid of the strained elixir. Allow to burn completely, although be sure this occurs in a fire safe area or container and the working is monitored at all times. (See the picture below.) You can place the jar in a big pot, for example, or in the kitchen sink (away from curtains). 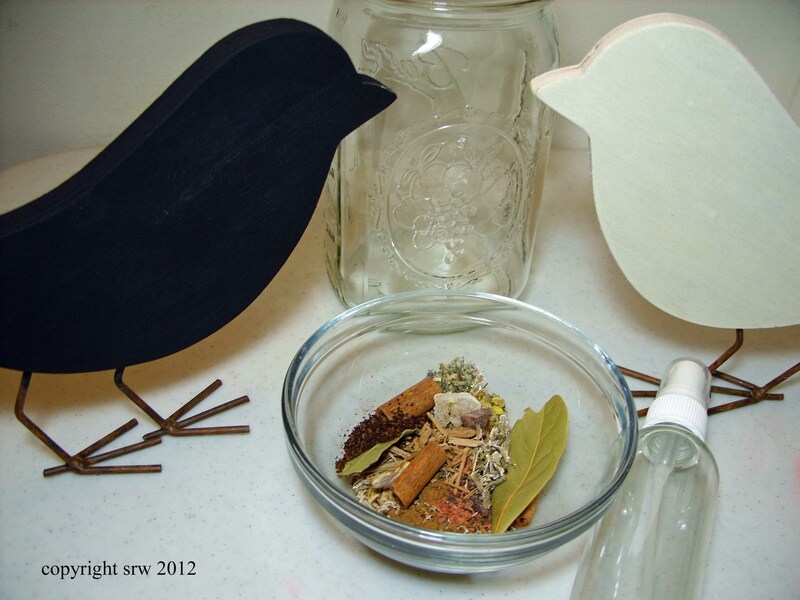 You can also use a tea candle if you feel a votive or taper will take too long. Repeat the chant above nine times as you light the candle. This is the final act of empowerment. Draw three equal-armed crosses in the air over the candle to seal the working. Step Nine. Pour the Elixir into clearly marked spray bottles. Store your Activation Elixir in the refrigerator for a longer shelf life. Make sure your Elixir is well marked, and place warning signs on the container that it should not be ingested. To empower the bottle in the spirit world you draw three circles in the air with the bottle in your dominant hand. Then, you quickly toss the bottle through the invisible circle, punch your hand through the invisible circle and catch the bottle before it drops. Um. Don’t try this with a glass bottle. The thought here is that as you threw the bottle (quickly) into the circle area, it drew in the positive energies from another realm, then, as you catch it and draw it back, you are drawing that power into your world. Yeah. Takes practice. Have at it.